Up and down views are something I rarely get to draw in Montreal. Flat street scenes can get pretty boring, I’ll admit. Rockport is all hills. Views leading down to the harbour and up through houses and gardens. 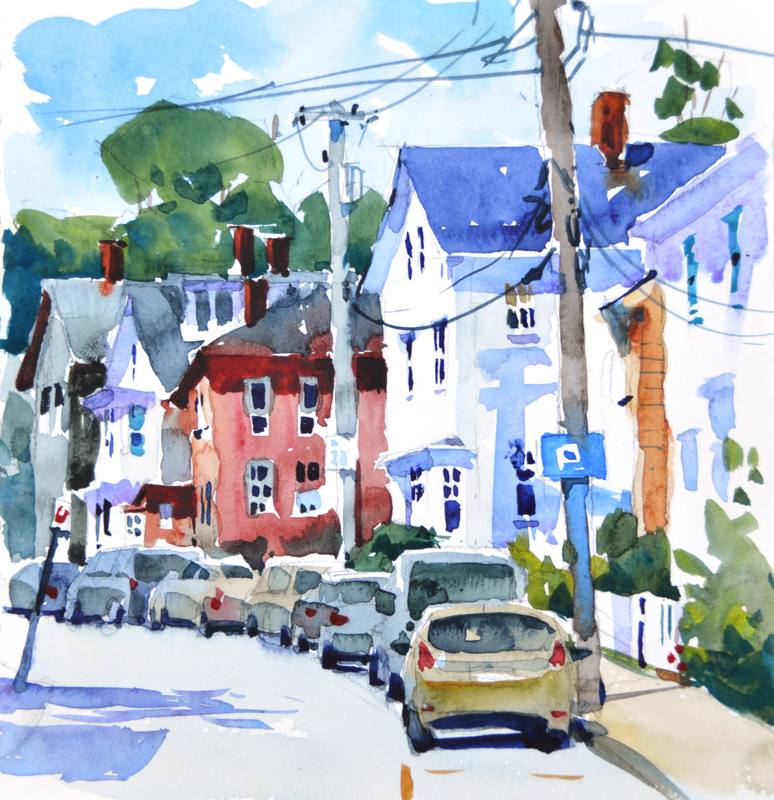 For this sketch I had one goal– to put down colour and value in the simplest way possible. There’s very little glazing in this type of approach. Mix the colour as accurately as possible on your brush, put the wash on the paper, drop in more colour if it’s too light, and let it dry. It’s a great mental exercise because it forces you to really look at one shape next to another before you put any pigment on paper. What a great exercise! This sketch feels so full of life in its simple approach. I’ve only been to Rockport once, but your paintings bring it all back for me. As you can see, it’s a place that I love… Every street and every alley is a sketch for me. Thanks for writing Susan. And if you get a chance to go back, take your sketchbook. This is actually quite a complex scene but I tried to simplify it. This one is SPECTACULAR!! I agree with Jodi, you make it look so easy. I’m going to save this one so I can refer to just how you dealt with the layers of cars, shadows, shapes. . . You are amazing! Thanks for this one FOR SURE! You are very kind. Glad you like it! You’ve captured the light so beautifully. I really get a sense of the temperature. Nice job on the cars. That little slash of light between the foreground cars is perfect. Looks like you are having fun there! I am back now (sorry for taking so long to respond to comments!) but I had a great time there. I agree with you Charlie. The curve got my instant attention. The curve is part of perspective? I think that’s right. Yes… but I always seem to get them looking a bit wrong so Shari’s sketch is super impressive! Colors in this just pop….love it! Well, I’m definitely going down hill and enjoying every house, tree, bush, pole – just every moment . Great job on the cars as well. Thanks so much Soni. That was exactly what I did with my brush — follow every house and tree. It’s a good description. So clean and fresh. The colours are amazing – as is the painting. Thank you for sharing so generously as I’ll probably never have the opportunity to paint with you in person. Waiting to hear which Rockport this is. I love this sketch. It is lovely. You even make the cars interesting. Urban scenes are my favorite. This is in Massachusetts Judy. Thanks for writing. I am looking at this painting at around 5:30 a.m. What a great way to start the day. Your painting is so bright and refreshing, no doubt as a result of the approach you describe. I love it. I always say truth is simple … maybe painting/sketching is too when understood is terms of basics … shapes, color, values …. the results can appear complex in the hands of a master. That’s the best time of day Louise. I am an early bird so when you are reading this I may be out painting… trying to simplify those shapes, colours and values. You are such an inspiration to us all Shari – thank you! I love to paint and sketch, it’s an added bonus for me that there is a receptive audience out there and I’m lucky to have such wonderful feedback. It’s my good fortune Judith. Glad you like it Monique. Thanks so much for taking the time to write Bernie. Much appreciated. Hi Patricia, I can’t see your painting but it is fine that you try to copy the work. Many people do that but I appreciate hearing about it. Great to hear that you have taken up drawing and painting, and that certainly is a great book to start with. Good luck with your painting! Thanks so much for letting me know. Glad you like the classes! Remarkable . I am impressed with your composition, placement of colors and the accuracy of the buildings relative to size and perspective . The handling of the vehicles , equally remarkable . Did you do this in one session and were you in the street ? I see two blues in the sky, did you plan that ? All in all Shari this is a wonderful painting to study , thanks ! Thanks for writing and glad you like it! I did do all this in one sitting, and I wasn’t on the street. I found a spot between two buildings, in the shade, and tucked myself in there. It took about an hour to complete this. I don’t remember the specifics of the blue in the sky but I think it was just one pigment. Hi Thomas, I was not in my car. Since it’s a curved street I had a great view from a shady spot between two buildings. It was the perfect place to sit. I would love to do a book as well but no publishers have phoned me yet… Still waiting for that! It was so nice to meet you too. I had the best time at that event. Loved the constant stream of people who wandered by. Hope to see you some time in NYC!